Wn307 Fort des Rochers du Var ou Fort St Martin, K.V.U.Gruppe Joburg, K.V.Gruppe Periers. Wn307 Fort des Rochers du Var ou Fort St Martin. Fort North of Port Racine. From file 'DEFE 2-138 Clawhammer - Cap de la Hague' 1942. Fort North of Port Racine. 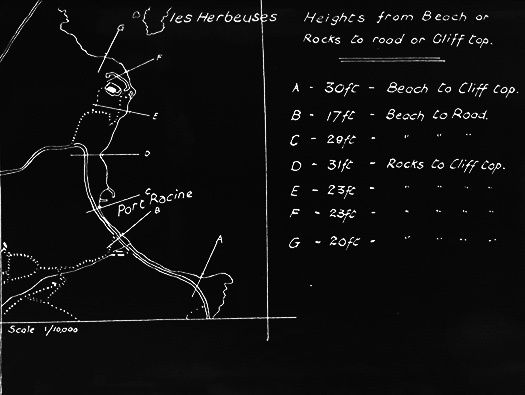 From file 'DEFE 2-138 Clawhammer - Cap de la Hague' 1942, S6 is the landing beach that could have been used in Operation Clawhammer. An operation a planned operation that was not used. Commandos and a Goatley assault boat. Early Commando close quarter fighting. The rocks of les Herbeuses. British government asked the public to send in photos of their holidays abroad. Thousands were sent in and teams of young women working for Army Intelligence filed them away. If an operation was imminent the pictures could be pulled out and used to see what the beaches looked like. This was is one of the photo sent in and used in file DEFE 2-138. A French postcard showing how the roof was crenellated. DEFE 2-138 landing beach details. DEFE 2-138 is as far as I can see, this is a file to be used if a small landing was to be planned on the Hagué peninsular. 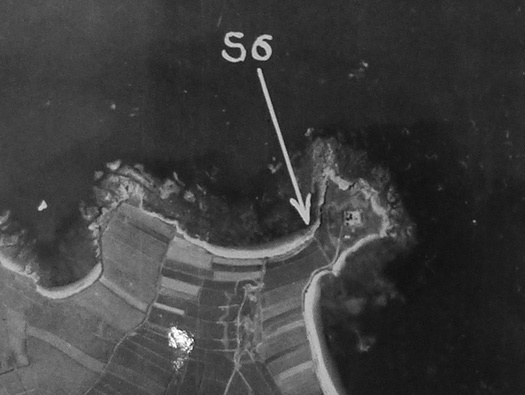 Between 1940-1943, many landings were planned and made on German occupied land. Some were successful but some were complete disasters. 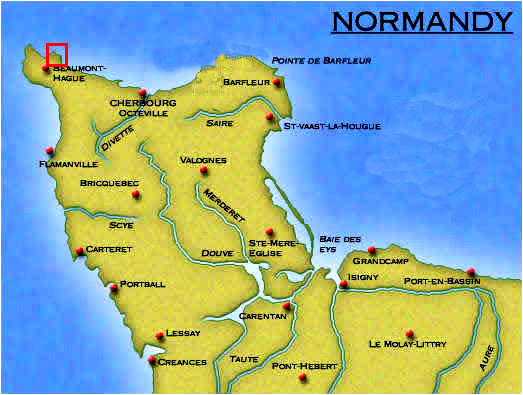 One disaster was 'Aquitint' a reconnaissance on what was to become 'Omaha Beach' before D-Day had been planned. Resulted in all the partisipance rounded up and either killed in action, shot as spies with one escaped back to England through France . The plaque for Operation Aquitint on the sea wall at Les Moulins, Omaha Beach. 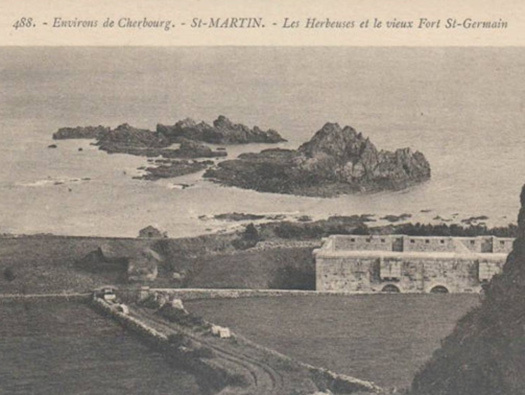 Fort of the Rocks or Fort St Martin. John with me taking the picture. The Fort has had a top layer built on to it to allow more space inside. The towers are rectangular buildings with three levels including two vaulted. The "ground divide" accessible only the first floor is dedicated to living and cooking. 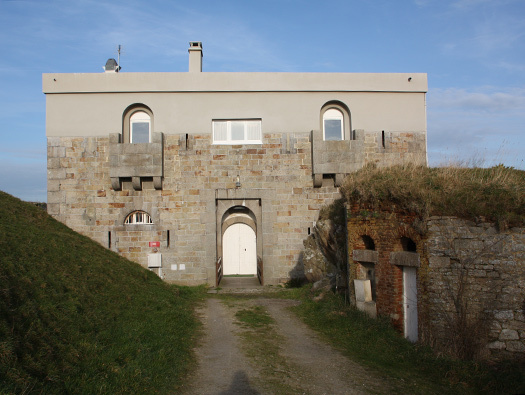 The main level, which is the entrance, is one of the barracks of the troops, the chief and the keeper. The third level is an open terrace with a crenelated parapet, arranged to collect rain water to feed a tank in the basement. The walls of a half meters to two meters thick to enable them to withstand light artillery, and their vaults to bring a few pieces of small calibre guns. 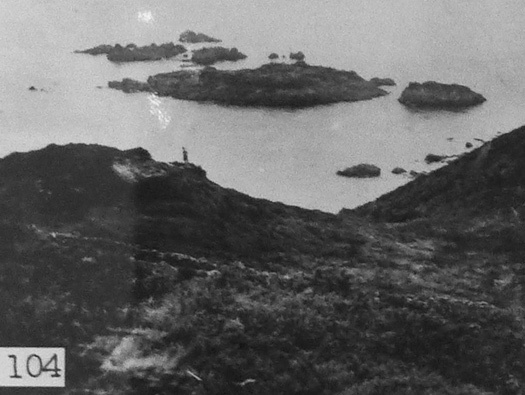 The towers, quite expensive and theoretically reserved for points very exposed and isolated coastline. (translation). This is where the draw bridge was. Part of the curtain wall removed to allow a view. Inside down stairs. This would have been the infantries accommodation in bunk beds. Probably a platoon of German soldiers. Outside on the defending earth wall is this Unterstand, one of ten that were here. Embrasure for a machine gun. Part of the old fortifications. Part of a curtain wall. Part of a curtain wall on the inside. The two smaller French rifle loopholes either side of a German made machine gun loophole. A ancient chapel to the fort. Part of the curtain wall with a (I think) a mortar position. Mortar base. It would have had sand bags built up around the front face. 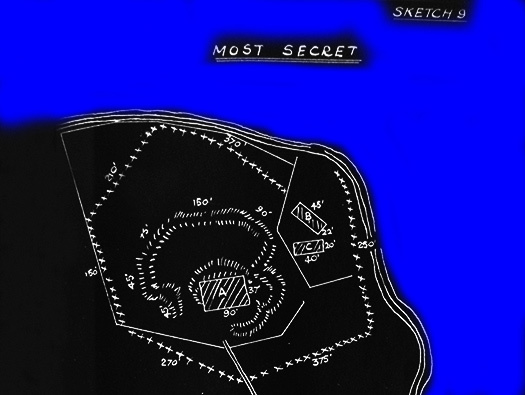 Plan from a Martian Report file N0.12 23 Aug 44. 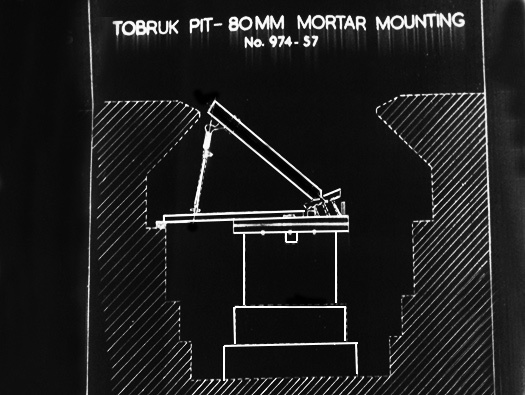 Plan of a Mortar Tobruk with a centre mounting to take an 80mm Mortar. The base of this looks very like the one here at Fort St Martin. Mortar base showing a niche underneath to hold ready ammunition. A box of 80mm mortar ammunition. The outer defence of the fort. One of the outer buildings. Outer defence. Another unterstand in the corner. Making up machine gun belts. Machine gun embrasure in the wall. Eisenpfahel [iron stake] set into the ground upside down. This was so a directional lamp could be stood on the top and direct men out on patrol where to go. Shelter with railway lines set into the concrete to strengthen it. Niche by the defensive outer wall. Niche. This may have been to keep ready ammunition in. It probably had wooden doors but could have had cast concrete doors. Inside a nice yellow paint.